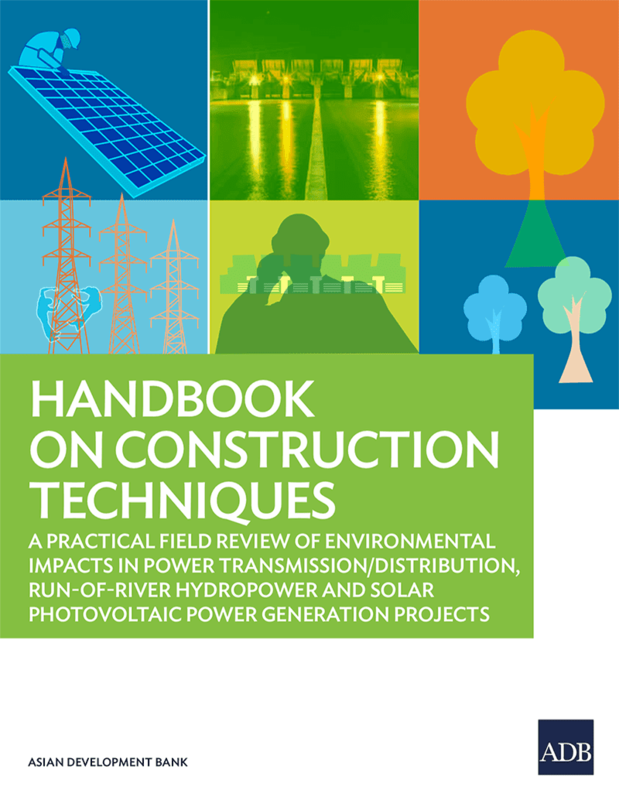 The handbook highlights a broad spectrum of environmental impacts triggered due to construction, operations and maintenance and their mitigation for power transmission & distribution, run-of-river hydropower and solar photovoltaic generation projects. These include impacts on physical resources, environmental resources, ecological resources and the human environment in the project area. This handbook discusses construction related project aspects and presents an inventory of methodologies used, their environmental impacts, mitigation and management issues for dissemination among Asian Development Bank’s (ADB) specialists who are working in the energy sector and environment fields, are involved in appraisal, day-to-day due-diligence for project approvals, progress monitoring and impact evaluation. 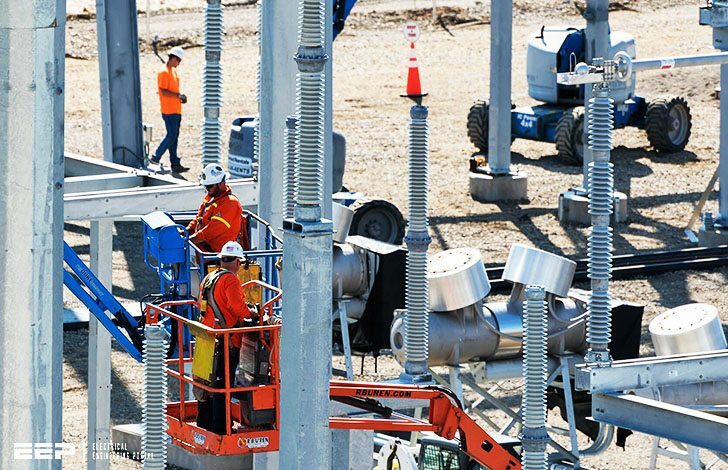 This section discusses various project design aspects and lists various stages of construction process along with the environmental impacts, type, impact and impact mitigation measures for power transmission and distribution line projects. Power Transmission lines – Voltages above 33 kV i.e. 66 kV, 110 kV, 132 kV, 220 kV, 400 kV, 765 kV, 800 HVDC (High Voltage Direct Current). 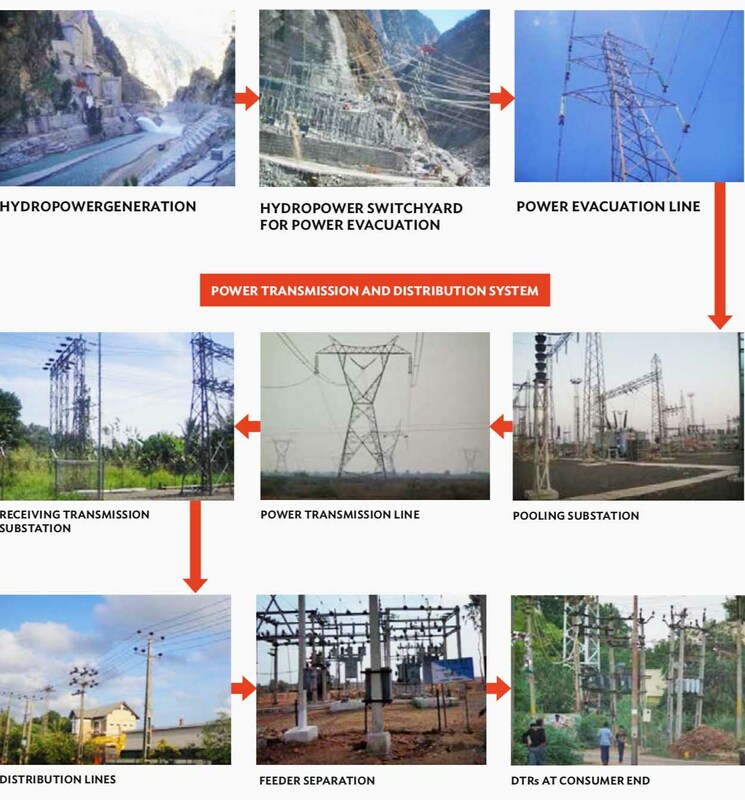 Power Distribution lines – 33 kV including High Voltage Distribution System (HVDS), 22 kV, 15 kV, 11 kV, 0.4 kV and rural feeders. Transmission line is linear project and one of the key factors that govern the design of transmission projects is the possible infringement of populated/forest/cultivated area and scarce land. Normally, the route of the transmission lines does not involve any human habitation. As a principle, alignments are generally cited at-least 500 m away from major towns, whenever possible, to account for future urban expansion and electromagnetic field for at-least 50 m away from any houses or structures. Any monument of cultural or historical importance is not affected by the route of the transmission line. The proposed route of transmission line does not create any threat to the survival of any community or indigenous peoples. The proposed route of transmission line does not affect any public utility services, playgrounds, schools, community places, temples and other establishments etc. The line route does not pass through any sanctuaries, protected park etc. Similarly, plantations/ forests are avoided to the maximum extent possible. Whenever it is not possible, a route is selected in consultation with the forest department that causes minimum damage to existing plantation/forest resources. The line route does not infringe with area of natural resources. Alignments selected to avoid wetlands and unstable areas for both nancial and environmental reasons.